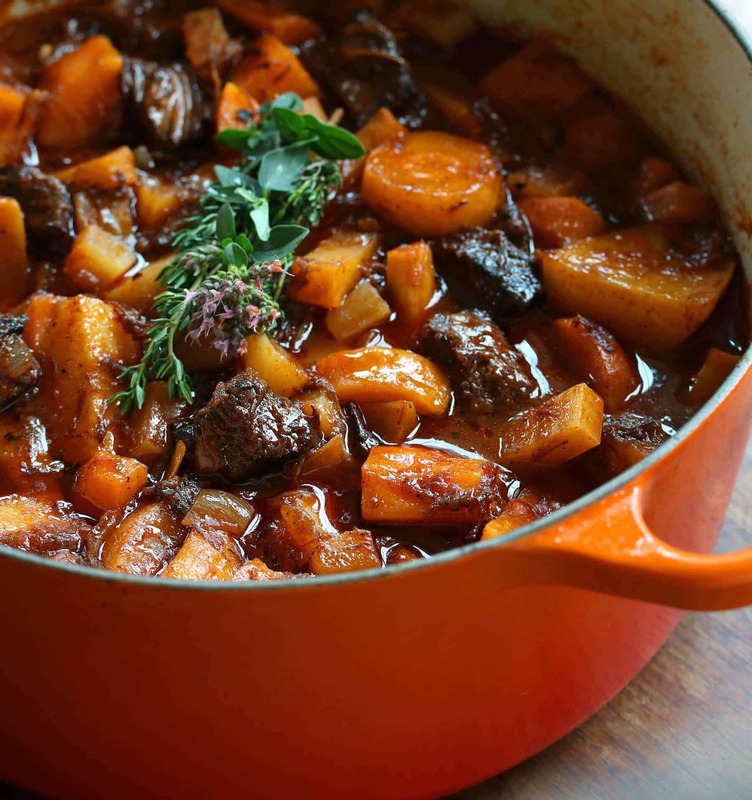 The French really know how to make great stews. Here is one of them and it uses a method similar to that of German Sauerbraten and corned beef to achieve both an exquisitely tangy flavor and a lusciously tender beef. 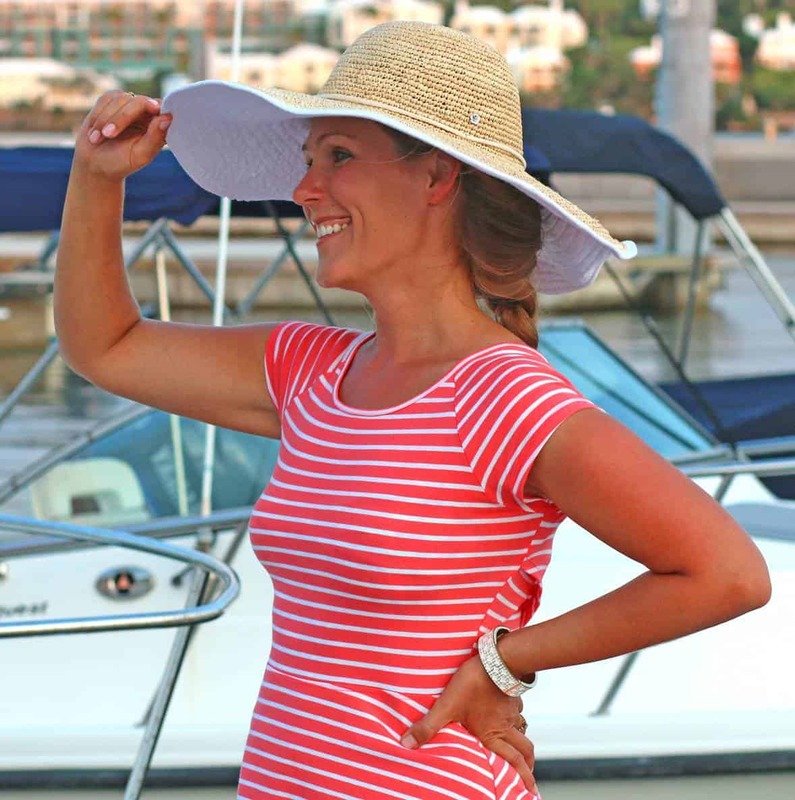 Many of you have already been introduced to my French friend, Sandrine, from here and here. She shared a recipe with me that inspired this adaptation: A traditional French stew featuring old-fashioned vegetables. Hence, its French name, Daube de Boeuf Aux Legumes Anciens. It’s a delicious and hearty stew packed with a variety of healthy veggies and a flavor you’ll fall in love with. I thought it only fitting to my Le Creuset dutch oven for the occasion. Sandrine had the fortune of inheriting her great-grandmother’s Le Creuset. Her great-grandmother was an accomplished cook and owned a cafe next to a castle in Lorraine. Of all things to have inherited from her I can’t think of anything more perfect than her old Le Creuset. To think of how many meals were made in that Le Creuset and the stories and history surrounding it. That’s special. There’s a certain romance about cooking utensils that have stood the test of time and were used with loving care to make food as expressions of love. I don’t have an heirloom like that but someday my daughter and granddaughter – maybe even my great-granddaughter – will have one because my Le Creuset is going to be passed down, too. And being the sentimental traditionalist that I am, I chose mine in the original Flame color that goes back to Le Creuset’s beginnings in 1925. This beautiful and robustly rich stew featuring vegetables that were staples in our grandmother’s and great-grandmother’s kitchens but several of which have since fallen out of popularity, which is a shame. 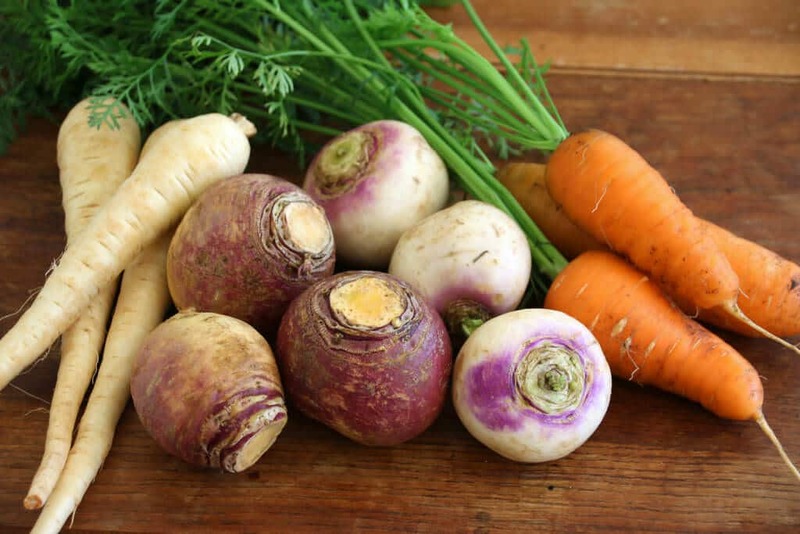 Turnips, rutabagas and parsnips were as much staples a hundred years ago as carrots and potatoes are today. They contribute such a fantastic flavor and texture to this stew, so be sure to use them and don’t be tempted to look for substitutes. Another vegetable that would commonly be added to this traditional stew in France is salsify, a delicious and versatile Winter root vegetable in the dandelion family. It’s very difficult to find here in the U.S. but if you have a local produce shop that carries it, grab some and add it to the stew. This stew is also naturally gluten free and paleo. Cut up the meat into 1-inch chunks. The meat is going to simmer for two hours, so that will enough to tenderize it anyway, but generally you want to cut it against the grains for optimal tenderness. 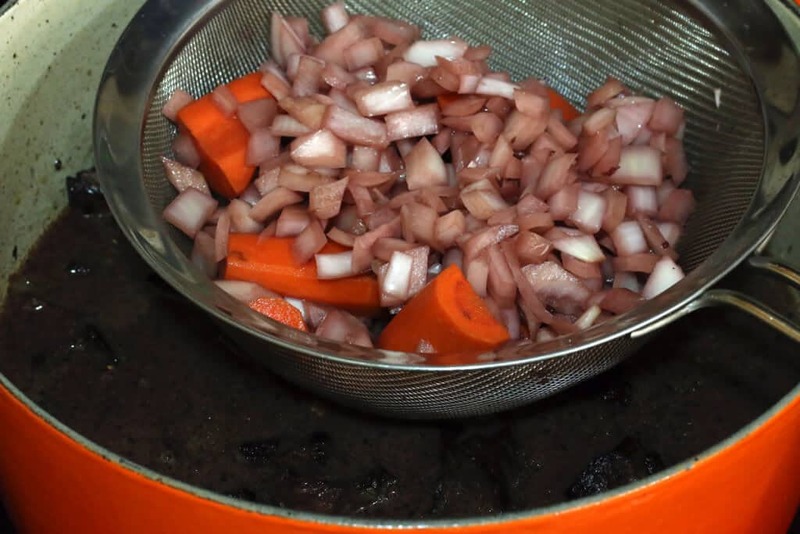 Place the beef in the dutch oven with the onions and carrots and the bouquet garni. 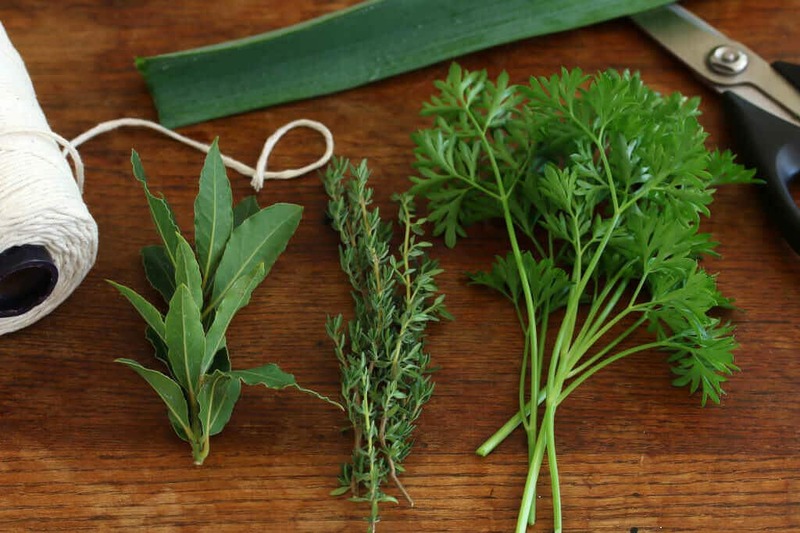 For quick and easy tutorial on how to make a bouquet garni, see my post How To Make A Bouquet Garni. Add the red wine and the red wine vinegar. Cover and let marinate in the fridge for 24 hours. After it has fully marinated, remove the beef and pat it with paper towels to remove the excess moisture. This will enable it to brown properly and get that brown crust that is essential for the flavor of the stew. Heat the oil in the dutch oven over medium-high heat once the oil is very hot add the beef, a few pieces at a time. Be sure not to overcrowd the pot otherwise the beef won’t brown, it will simply steam. Generously brown the pieces on all sides. Transfer them to a plate and set aside. The browned crust that develops on the bottom of you pot – keep it! Don’t throw it out, that’s going to make your stew taste heavenly. Later when you add the liquid your going to do what’s known as “deglazing” the pot. That’s when you scrape up those luscious browned bits and incorporate them into the stew. Add the onions and cook until golden brown. Add the garlic and cook for another minute. Strain the contents of the marinade into a sieve over the dutch oven. You want all of the original marinade in the dutch oven. Discard the onions and carrots from the marinade but keep the bouquet garni. Return the beef to the Dutch oven with the bouquet garni and the whole cloves. (Note: You can choose to wrap the cloves in a bit of cheesecloth or muslin so that you don’t have to fish them out later from the serving on your plate.) 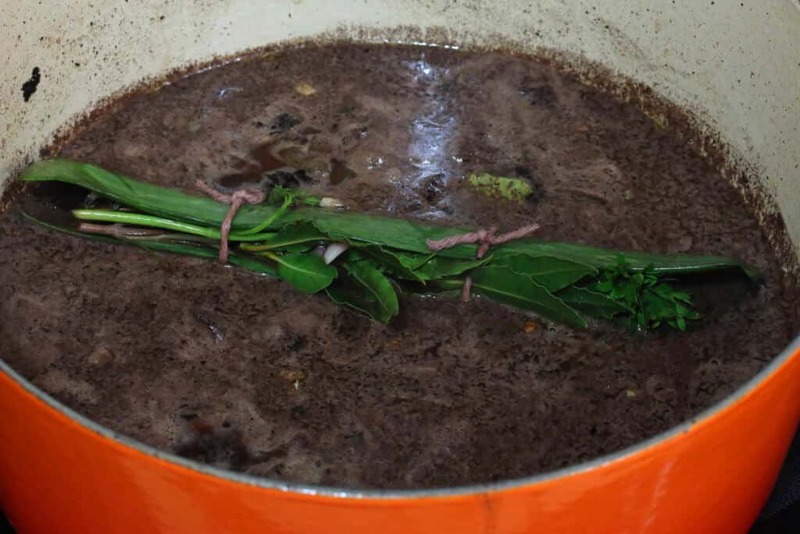 Bring to a boil, reduce the heat to low, cover and simmer for 1 hour. Towards the end of the hour, chop up the vegetables. For contrast and variety, I like to chop each of the vegetables into different shapes and sizes. Add the vegetables along with the tomato sauce, salt and pepper. Stir a bit to combine. Return everything to a boil, reduce the heat to low, cover and simmer for another hour or until the vegetables are soft. Add salt and pepper to taste. *If you think the beef can handle further cooking without falling apart, go ahead and simmer it for another 30 or more minutes, it will only get better! This stew is even better the next day as the flavors have more time to meld. 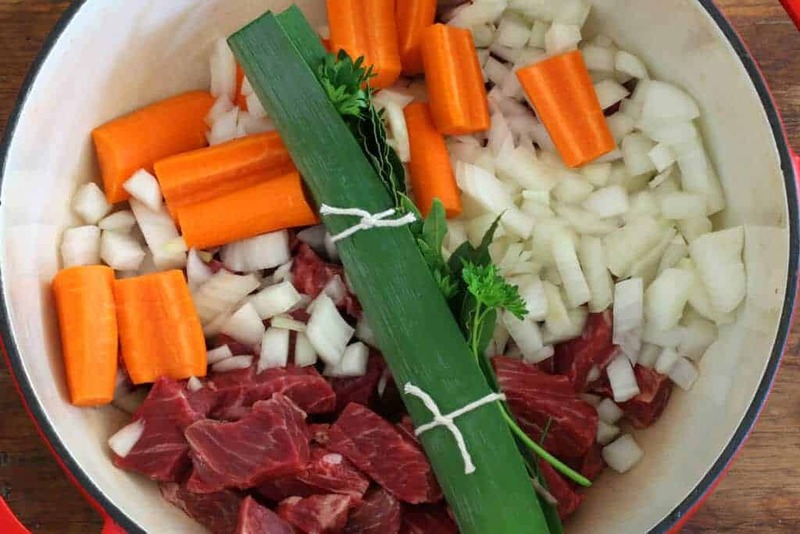 Place the beef in the dutch oven with the onions and carrots and and bouquet garni. Heat the oil in the dutch oven over medium-high heat once the oil is very hot add the beef, a few pieces at a time. Be sure not to overcrowd the pot otherwise the beef won't brown, it will simply steam. Generously brown the pieces on all sides. Transfer them to a plate and set aside. The browned crust that develops on the bottom of you pot - keep it! Don't throw it out, that's going to make your stew taste heavenly. Later when you add the liquid your going to do what's known as "deglazing" the pot. That's when you scrape up those luscious browned bits and incorporate them into the stew. Return the beef to the Dutch oven with the bouquet garni and the whole cloves. (Note: You can choose to wrap the cloves in a bit of cheesecloth or muslin so that you don't have to fish them out later from the serving on your plate.) Bring to a boil, reduce the heat to low, cover and simmer for 1 hour. Return everything to a boil, reduce the heat to low, cover and simmer for another hour or until the vegetables are soft. Add salt and pepper to taste. 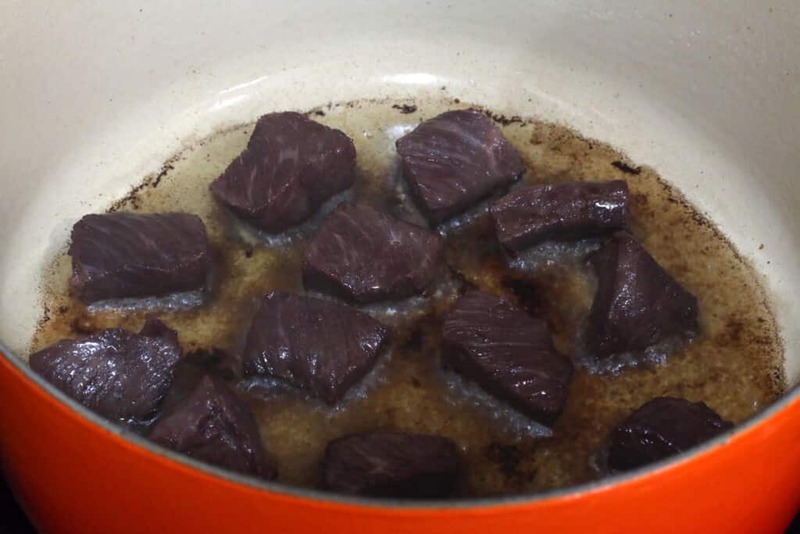 *If you think the beef can handle further cooking without falling apart, go ahead and simmer it for another 30 or more minutes, it will only get better! This stew is even better the next day after the flavors have had time to meld. Another vegetable that would commonly be added to this traditional stew in France is salsify, a delicious and versatile Winter root vegetable in the dandelion family. It's very difficult to find here in the U.S. but if you have a local produce shop that carries it, grab some and add it to the stew. This stew looks so hearty and delicious. Love!! I really enjoy making dishes like this over the weekend, so I can have leftovers for the week. Perhaps I’ll make this tomorrow :)! I really like that you cut the vegetables into varying shapes and sizes. I’ll be doing that in the future! The stew looks delicious. I wish I could have been hanging around your house while it was simmering. Thanks, Christiane, the aroma was exquisite! 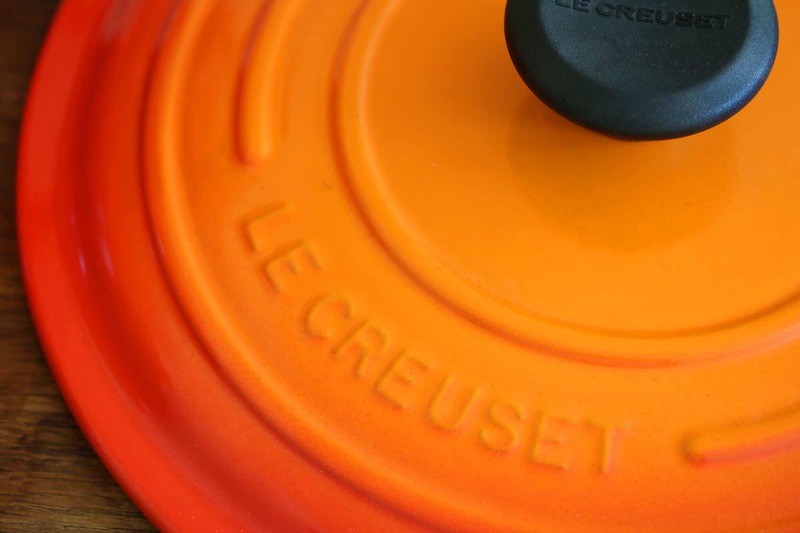 Having a Le Creuset dutch oven is certainly on my wish list! Winter stews are the best and a quality dutch oven makes them easy to let simmer for hours. I agree, Brandy, and I love that you can use them for a long slow simmer on the stovetop or in the oven. The enameled 8 QT Dutch ovens I’ve had only lasted about 3 years before the enamel started coming off the inside…The first one was a Le Creuset, the 2nd was a Martha Stewart. I replaced the MS with an AllClad D5…In November I bought the 6.5 quart Tramontina enameled dutch oven (looks gorgeous) on sale at Sam’s Club for 36.00 including shipping….so far, it’s just as good as the other brands….The Le Creuset would have cost 10X as much…. How are you cleaning the dutch ovens? If you don’t let them cool before cleaning that will surely shorten their lifespan. I’ve had all my enameled (Le Crueset and Staub) for between 5-12 years with no issues. Oh my goodness this looks rich and good. I was reading the recipe, and have never tried the 24-hour marination at room temp. I’m ready to do it! I do wonder, though, when to add the beef back into the pot? I see we brown it and then take it out and set it aside, but I don’t see at what point we add it back. Thank you! This stew looks so good, definitely one of my favorite cold weather meals! Such a beautiful meal, and it looks so comforting! I have a Le Creuset with the same color and love using it all the time!! This delicious and hearty beef stew is the perfect dish to cook in it! Perfect comfort food for winter! 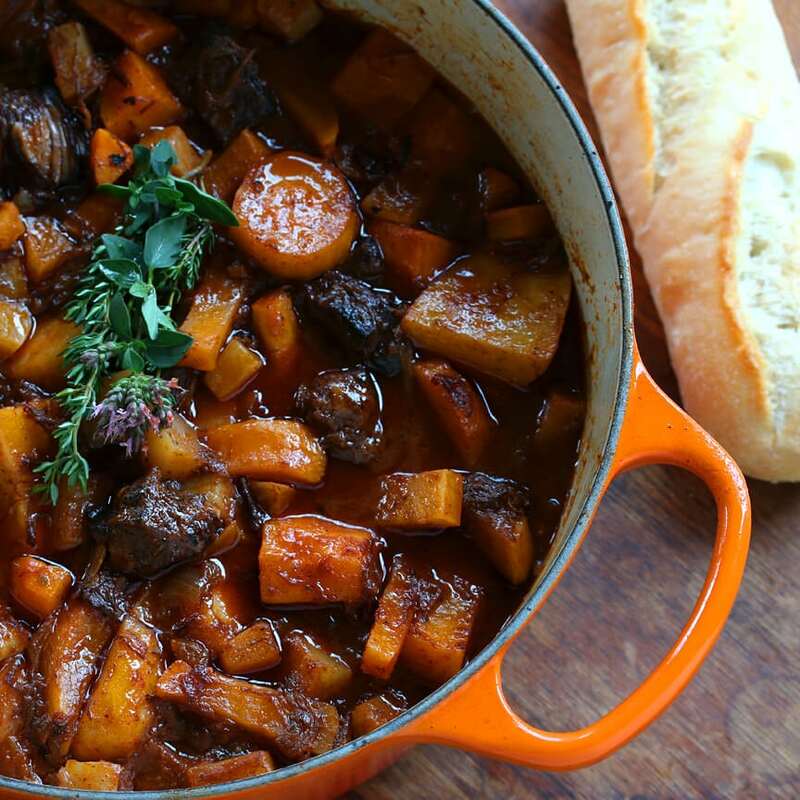 The french do know how to make a great stew. Probably because they aren’t afraid of fat. 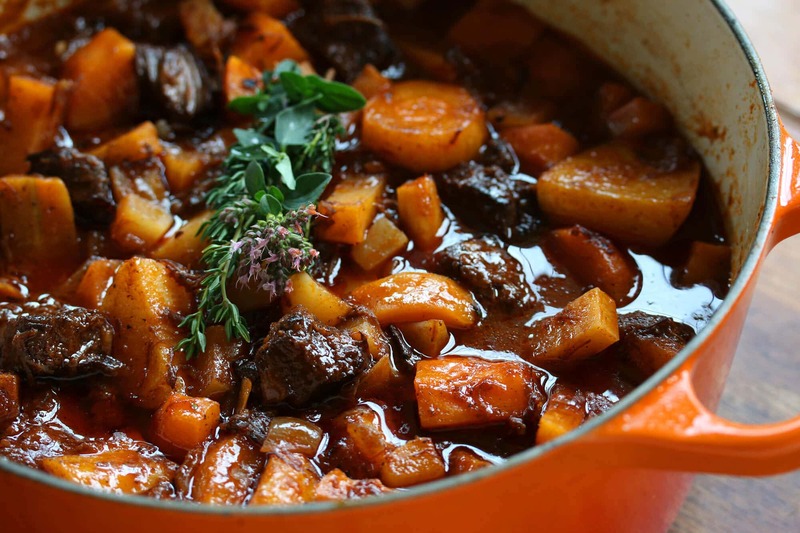 This is a gorgeous stew, I bet your house smells amazing while you are making it! This stew sounds & looks so rich & flavorful! :) I LOVE that red wine marinade. And it is such a nice change to use the turnips, parsnips, & rutabagas instead of the usual potatoes & carrots. What an incredibly gorgeous stew!! I’ll bet my stew hating husband (crazy right??) will absolutely love this one!! I love how you wrapped the herbs in the leek and also your idea of different sizes of veggies and of course the wine in the broth!! This is absolutely stunning. I love beef stew but always find it hard to photograph. You nailed it. This is so beautiful. I dig that you used such fabulous root veggies. I grew up eating all of those ones. I love parsnips, but turnips not so much. But back in the day we ate them anyway. No picky eating allowed back then. I swear I can just imagine how awesome this tastes. Day one would be fabulous, then day two the flavour would build even more and leftovers would rock. If there was any left because it’s so darn good. My hubs bought me a Le CreCre (I say that because I can’t pronounce the actual name properly). It’s my first dutch oven from them. I have a grill pan my friend Liz (that skinny b) gave me at a conference one year. She won it but already had one so she gave it to me. Then I passed out. I have one of their tiny little Cocottes too because I wanted to say I owned a Le CreCre back in the day and it was the only one I could afford, it was a whooping $20. Lol. I love beef stew, and yours looks heavenly. Perfect for this cold, wet weather we’re having in Portland. This stew is perfect for winter. 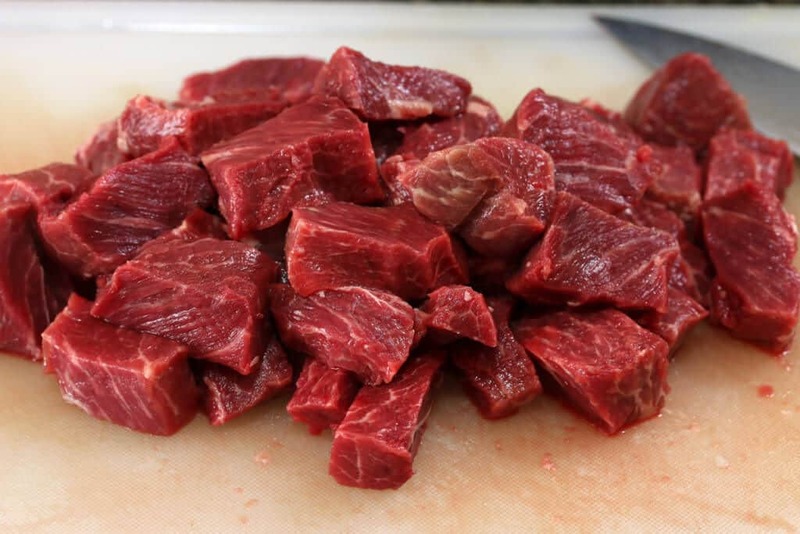 So meaty and delicious…I want a bowl now! I can almost smell it! And I love that orange Creuset! Oh I have to try this, sounds delicious, I think my I pad has smell a vision. Your beautiful photos make me want to cook every thing you make. Tell me that you are writing a cookbook in the near future because I am definitely buying one if you are. I have quite a collection dating back to the 1800’s and yours would be a nice addition. I have a Le Creuset Dutch oven (just like yours) that was passed down from my grandparents, and it is one of the most treasured things in my kitchen! 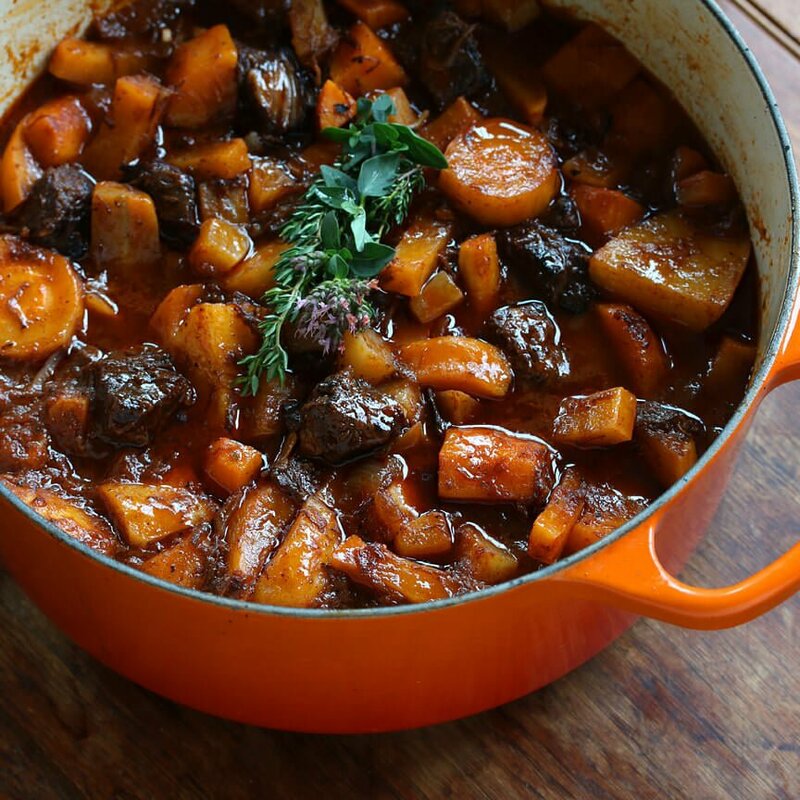 This stew looks like the perfect thing to cook next in my Le Creuset. A big bowl of this stew, a loaf of crusty bread, a bottle (or box) of wine and a big spoon would make me a very happy girl!! And the best part of about it, Judy, is that all of that’s very easy to arrange! :) Here’s to Happiness! Or maybe your grandSON will inherit it! This looks fantastic! It’s freezing cold these days, the perfect time to try this. That browned beef is the only way to make a GREAT stew!! And those rustic veggies totally make this so comforting!! I made this exactly as written. One of the worst stews & waste of ingredients I’ve ever made! The vinegar overpowered the gravy & the cloves made this waaaay too sweet! The vegetables had no flavor because they were over powered by the vinegar & cloves. I’ll not be making this again! Hi Ann, I’m sorry to hear this wasn’t to your taste. 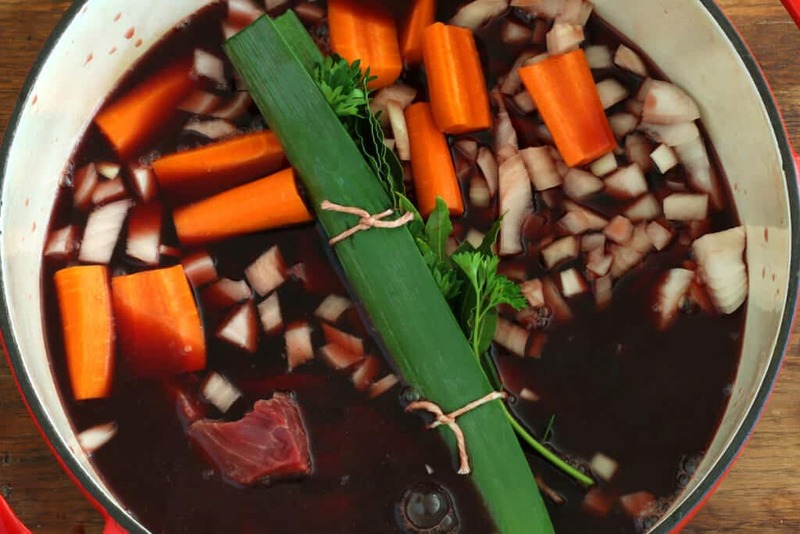 Vinegar-based stews like this, much like German Sauerbraten, have been around for centuries and, while beloved by those familiar with them, are an acquired taste. I can understand how it could be off-putting to someone not familiar with this particular style of food. Why are we discarding first batch of onions/carrots? Hi Renon, the pieces of onion and carrot along with the bouquet garni are to flavor the marinade. If you prefer to keep those pieces and cook them up with the rest of the stew you can certainly do that. We loved it! I will change wine next time. Maybe smaller ratio of wine & vinegar and add broth. Maybe we are too American for wine marinated beef! Lol, Renon! Yes, wine-marinated beef or chicken forms the basis of many of the most famous French stews. So glad you enjoyed this, thank you! I am a huge fan of slow cooked stews and love French style cooking. After a quick google search, I hit this one and what a gem. Perfect for the snowy Maine day we had today. In my opinion, what separates this one is the vinegar and root vegetables. The varying flavors in this dish are remarkable, and this easily tops other stew recipes I have used. Make this tonight and you will fall in love! Thanks, Mark, I’m so thrilled to hear you enjoyed this as much as we do! Sorry to post so late, but I needed to ask a question about the wine in the marinade. I made a beef stew in the past that used about the same amount of wine and my family didn’t particularly like the strong flavor. Could I use one cup of red and sub beef broth for the remaining liquid? Absolutely, Rebecca – happy cooking! Thank you for sharing this amazing recipe! Your website is just lovely. I ended up using 3 lb of meat and 4 cups of wine (the whole bottle) – my husband loved it. I can’t wait for more dutch oven recipes! Wonderful, Mariya, I’m so glad you guys enjoyed it and appreciate the feedback, thank you! As a stew veteran I thought I’d give this one a try. I ignored a lot of my usual experience and followed the recepie verbatim and have to say… it’s just not that good. Firstly, it’s not very “French”. The vinegar immediately gives it a strong German / Dutch influence. 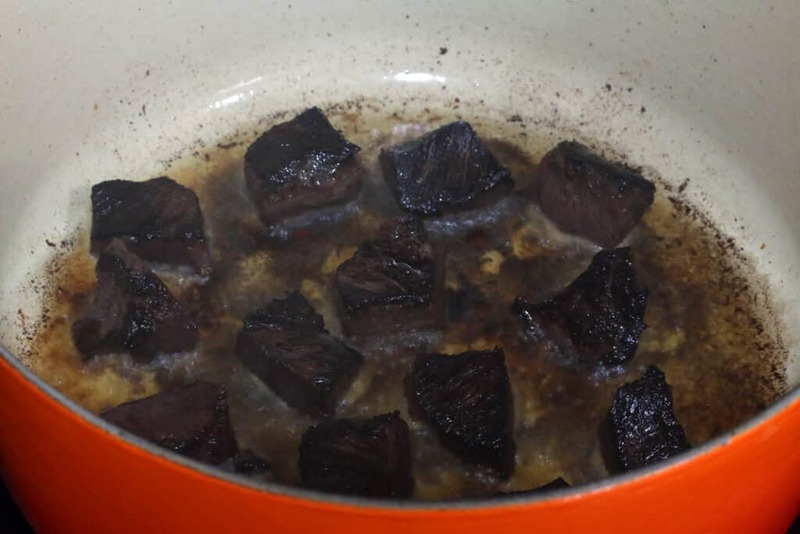 I would recommend the use of demi-glace to add more liquid and consider cutting the vegetables very small or including them when including the beef. Seasoning the beef on colouring would also be a good move to add more flavor. The vinegar adds that typically German flavor which I haven’t had in a stew before. It is strong and interesting and definitely different. Not bad at all but know this is non-typical in traditional French cooking that I’ve encountered. Hi JB, I can assure you that this is a very authentic and traditional French stew. Vinegar is actually very characteristic of some French regional cuisines, particularly northeastern France, i.e. Alsace-Lorraine. Sounds delightful! I’ve marinated tenderloins over night but with a garlic, sage, thyme and rosemary with worchestire, and balsamic vinegar mariinade and it’s always fantastic! 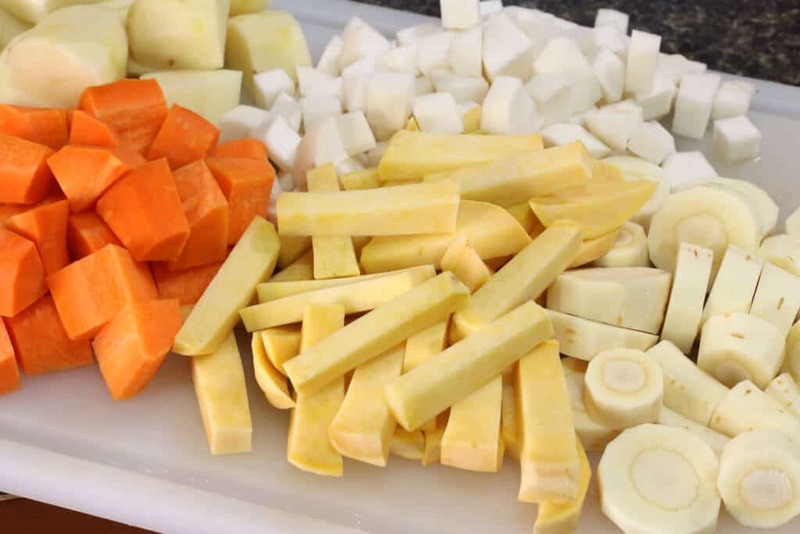 Love using root veggies in my stews! Thanks, making it for Packer Sunday! I have a catering business and I’ll be starting a website soon..it’s not just food illl be covering, travel and people as well! So it seems I am the first person not to realize the actual prep time needs to include 24 hours to marinade! Wanted to make stew for dinner tonight so googled and came across this recipe – saw the prep time was 2+ hours and planned accordingly. Just started dinner now and realized this will have to be tomorrow’s dinner! For those of us that google recipes at the store and just look at the cook/prep time and ingredient list it would be helpful to include the marinade time in the prep time. Hi Becca, no there really isn’t – add away! :) Happy cooking! This recipe doesn’t need the vinegar, imho. Put too many Vega legs so had to cook for 1/2 hour more to soften. Had to use a second pot due to too many vegetables. Flavor was good would like to add other vegetables like corn and peas for variety..would this work. I think it will get better as the flavors work in..
Made this a while back and instead of the potatoes added celeriac. It’s a lot of veg but delish. I definitely think it had a little too much vinegar flavor so I’m going to try a quarter cup next time instead. Making this again for Christmas dinner and serving over garlic mashed potatoes! Fabulous, Becca, thanks so much for the feedback! Tripped on this recipe a few years ago. It has become a must make item at least 2 times during the winter at our house. It’s tough to fit in a 3rd time as we don’t have a long cold season in the the Southeastern US. Makes the house smell amazing. I’m so glad your family enjoys it, Jill, thank you! Please forgive my ignorance as I am not much of a cook but willing to learn. 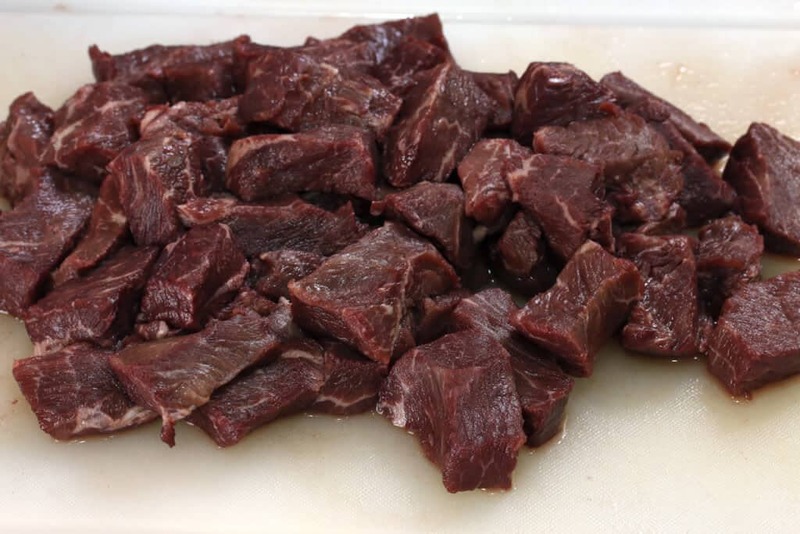 Can the leftovers from this beef stew be frozen? Thanks! Hi Mary, yes you can freeze it. 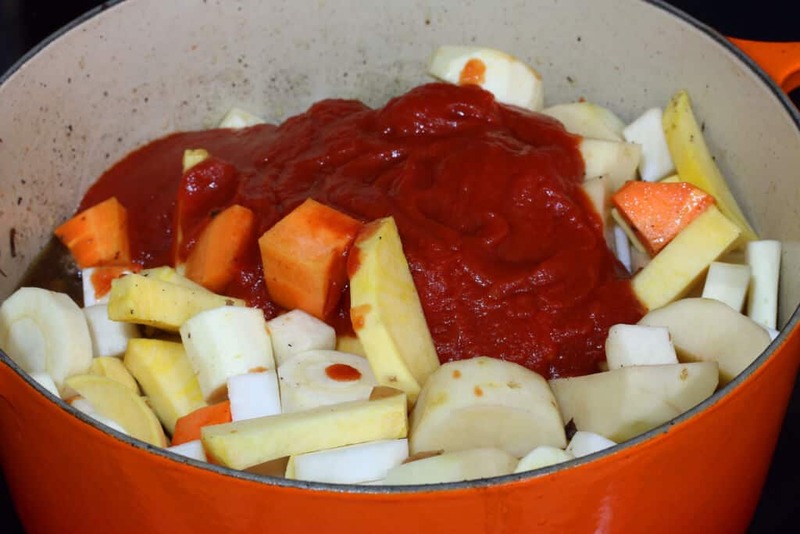 It will impact the texture of some of the veggies, the potatoes in particular (they’ll become soggy) but as long as you don’t mind that you’re good to go.